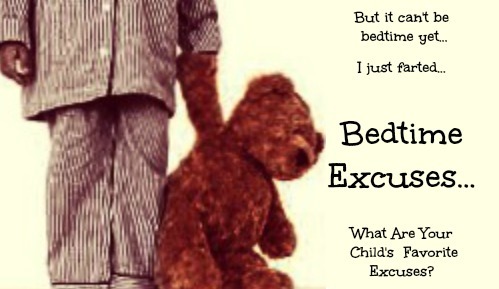 My Children's Top Bedtime Excuses- What's Your Child's Excuse? 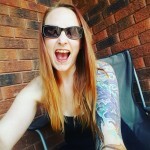 Have you ever gone to put your Children to bed and heard a million different excuses as to why they should be allowed to stay up just 10 minuets more? I have. Not very often mind you, at least for my Little Man, but he HAS tried. Baby Girl however, being as she is not quite as, shall we say, agreeable with her parents as Little Man always was, has already offered up a few for me to chuckle about. Now, Children can be tricky. It can be hard to decipher whether or not they are being truthful about some scenarios or if they are just trying to manipulate you, especially when they look at you with those big round eyes… reminding you of your favorite Cat character that sports boots better than any Canadian in -40 that I have seen… But you HAVE to be strong. Hold your ground. KNOW the difference. If you let them get away with manipulation just once… they will keep trying again and again. We have come across some pretty funny excuses over the last few years. However, out of all of them, I can easily pick my fave top 5. 1. But I just Farted, It can’t be bedtime…. “Well Mommy,” Little Man stated in a rather matter of fact tone, “When I fart, that usually means that I am going to have to poop soon, and if I go to bed before I finally poop, then I will have to get out of bed and go to the bathroom, and I know how much you dislike it when I get out of bed after you’ve already sang me my song… so, let’s just wait till I poop K?” No Little Man, it could be tomorrow morning before you poop, you are my child, blessed with my genes and you could just be gassy. GO TO BED. 2. But I am NOT Tired…. This one is great, because I get to put on my Mommy pants and respond with the appropriate “Mommy” answer. “Did I ask if you were tired sweetie?” To which I get a… “Well no Mommy” In which case I respond with: “Exactly, bedtime is bedtime, count some sheep, you will fall asleep soon.” This is usually followed by both of them falling to sleep immediately after I leave the room. Weren’t tired my Aunt Fanny. This is usually stated once I have parked my rear on the couch, and one of them has trailed out of their bedrooms looking as though they have just made a long trek through the desert and are dying of thirst. The only problem with this production is that I know for a fact that they have had more than enough water, especially for before bed, so they MUST be hallucinating from their desert trek to think they will be getting anymore time to stall…. They must set off back through the sierra and back to bed. NOW. It’s the middle of winter and you are wearing shorts and a t-shirt to bed, the heat is NOT jacked up and you are NOT a snowman. Take your blankets off if need be, but short of throwing you in a snowbank there is nothing I can do about that… GO BACK TO BED. That was the noise of your Mother’s blood pressure rising. I hear a noise too, it’s called “excuses”. I love you… GO BACK TO BED. What are your favorite bedtime excuses? We get excuses from DD6 all the time. One time, she saw spider in the garage, and said she was afraid it might be in her bed. Couldn’t stop laughing. Bedtime is a constant struggle around here. My 10 & 7 year old decide to have a blowout every night at bedtime and then all the other stuff starts….get me a drink….tuck me in. I am completely exhausted by the time they finally fall asleep and then mornings start off badly since they are grumpy from not getting to sleep on time. It’s a cycle! Haha! The first one made me laugh out loud. Too funny! My 3 year old son is the king of bed time excuses. Just tonight he used 5: I’m too hot, my hands are sticky, Can you put the blanket on me, I’m not tired and just pure crying!! It’s tough to watch him be so upset but my husband is good at holding his ground. I have a nine and 12 year old and listen they were so so much better when they were little. Well oldest girl always falls asleep instantly because she is almost a teen and she’s sleepy 100 % of the time. Seriously. But now I get excuses like mad from the 9 year old. Never used to be so bad. Ha, great list! My 3.5 year old’s favorite excuses are I’m hungry and I’m scared. The “I’m scared” gets me every time so I am in his room rubbing his back and singing a lullaby for the 3rd time. It’s so hard, because I can’t always tell if he IS scared or if it is just an excuse. Lol. Our little guy tries the thirsty, hot, not tired thing as well as I didn’t have my bed pee, I need another hug from (insert parent), I want different blankets and I forgot to say good night to the cats. He tries to stay up but he usually passes out within a few minutes of hitting the pillow.